Its day 100 today and My Daily Balloon is still going strong, so I made a strong man to celebrate. 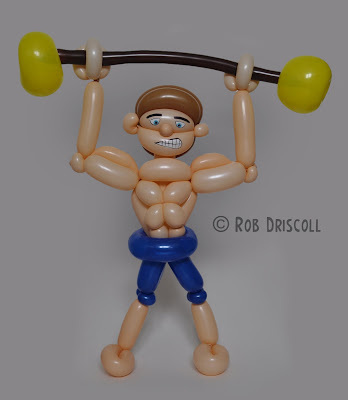 He is made from 13 balloons, mostly 260s, I started with his body which is made from 2 x 260s then added his arms from another 2 x 260s, his hands came next from a 160 and then I added in the pole from another 160. His face and hair is made from 2 x 260s and his shorts came next which is another 2 blue 260s, then I added in his legs which are another 260, the last thing to add was the weights which are 2 round 5" balloons.